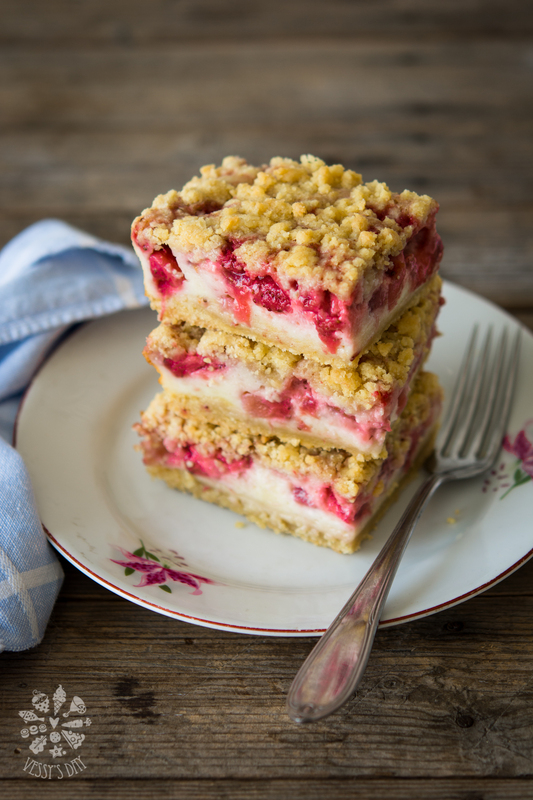 These strawberry crumb bars are so-so-so delicious and extra easy! You don’t need any special skills or equipment to make these, except delicious ripe and flavorful strawberries. I love all kinds of recipes. 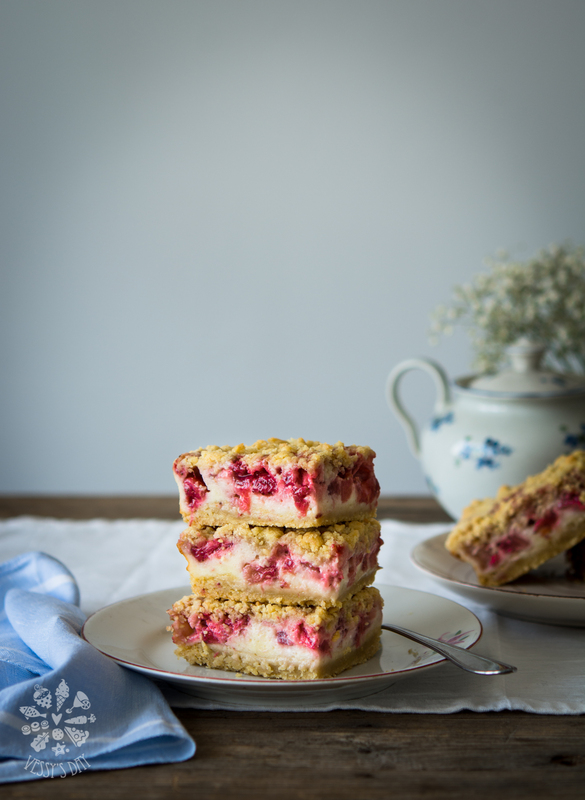 Long and complicated recipes usually don’t scare me but sometimes it feels like all you need is a delicious homemade piece of dessert that could be ready in no time without the fuzz and especially without spending long hours in the kitchen. Something simple to whip up in no time, a recipe that feels like a rest, instead of work. This recipe is one of those, that I call cozy and family friendly. Imagine the smell of just baked crisp buttery dough and strawberries. Family gathers around the pan and the whole thing is gone before you know it. Grease a 15/25cm (6″/10″) rectangular baking pan and line with parchment paper. Set aside. Preheat your oven to 170C fan-forced (340 F fan-forced). In a medium size bowl, stir together flour, brown sugar, soda, baking powder and salt. Add melted butter and mix to combine. Add 2/3 of the mixture to the pan and press down to the bottom until flat and even. Save the rest of the crust mixture for the top. In a small saucepan heat the strawberries and sugar over medium heat. Cook, stirring gently until sugar dissolves and strawberries release their juices (about 5 minutes). Set aside to cool off for a bit. In the meantime, in another bowl, combine all the rest ingredients and mix well. Pour the sour cream mixture over the crust, then distribute the strawberries over the sour cream. Sprinkle the rest of the dough over the strawberry/sour cream mixture, using your fingers. Bake for about 35 minutes or until the top is crisp and golden brown. I would love to try these! I have one question though: I can’t get sour cream where I live, do you think I could use 10%-fat greek yoghurt instead? Would I need to add some butter to increase the fat content? Hello Kat! Thank you for choosing my recipe and I hope you enjoy it. I would recommend you to use cream cheese instead (regular cream cheese, that you would use for cheesecake). Let me know how it goes and happy baking! I finally baked these and they were fantastic! I used 200 gr. cream cheese and 75 gr. greek yoghurt. I might use corn starch instead of flour next time because my sister mentioned she could taste it in the cream (I couldn’t) but other than that this was a great recipe, a keeper for sure – thank you! So glad to hear that, Kat! Starch is also a great option and will do the job. I used flour and wrote it in the recipe, because most of the people have flour on hands. Have a great weekend and hope to hear from you again!